*Tagging only nights, the spawning survey is not conducted on these nights. Please provide a number where you can be reached in case of last minute weather-related changes. Cumberland County Cape May County Either works for me! 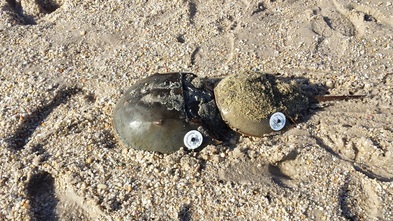 This project is being run by a group of organizations dedicated to the preservation of the Horseshoe Crab. By working together we can coordinate volunteer efforts to cover more beaches, get out more tags, and gather more data. The logos below link to each partner's web site so you can see some of the other great stuff they do, but to sign up as a volunteer simply fill out the volunteer form above.